My thirty-fourth stadium of 2011 was on Sunday 15th May 2011 at Broadhall Way in Stevenage, Hertfordshire. 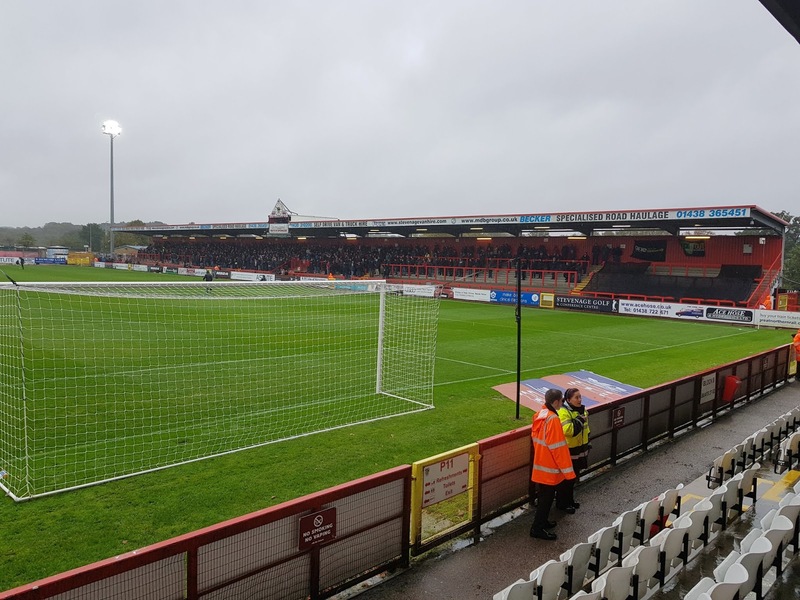 The match was Stevenage vs. Accrington Stanley in the Football League Two Play-Off Semi-Final. Broadhall Way sits within the Stevenage Brook wooded area in the south of the town. It is bordered by these woods to the south and has a primary school to the east and a retail park to the west. The A602 runs to the north with a football academy beyond this. 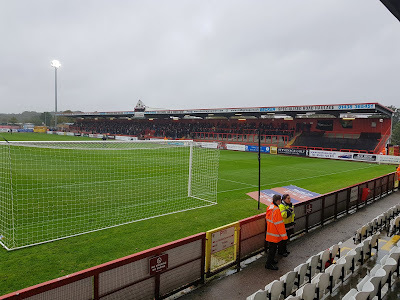 The venue is just over a mile south-east of Stevenage railway station and has been home to Stevenage FC (formerly Stevenage Borough) since 1980. The 2010/2011 season was the first one the ground had hosted league football. The ground comprises of two all-seater stands and two all-standing terraces. The first all-seater part of the ground is the Main Stand which is a slim single-tiered stand running alongside the western side of the pitch. This has a capacity of 1,800 and as its name suggests it contains much of the club's facilities with corporate boxes running along the back of the seating area. The other all-seater area is the South Stand which is the newest stand in the ground having been built in 2001. It is a typical modern stand which can house up to 1,390 away supporters. The two terraced sections are the North Terrace and the East Terrace. The North Terrace is the smallest stand in the ground, having a capacity of just 700. It is mostly covered but does have an open-ended section next to the East Terrace. The club recently announced that they plan to re-develop this part of the ground. The other stand is the 2,700 capacity East Terrace which is a fairly steep terrace which runs along the pitch opposite the Main Stand. This is where I stood for the game and with it being fairly steep it offered a good view of the action as well as retaining sound well to ensure a good atmosphere. The game was an entertaining one with both sides looking to gain an advantage in this Play-Off Semi-Final First Leg. Stevenage started the better team and took the lead with a deflected shot after 25 minutes. This gave the home side impetus and shortly after they rattled the crossbar with a stunning 30 yard volley. Just before the interval they poked home a second goal to lead 2-0 at the break. In the second half Accrington were gifted a golden opportunity to score from a bad backpass but managed to miss an open goal. From this point on there was only going to be one winner and the home side duly kept their two-goal lead.